I’ve been staring at the blinking cursor for a couple days now. Why is this? Well, I think life lately has been rather overwhelming, even if it is in the best way possible. I am traveling more than I am home, speaking more often than being silent, and seeing more new faces than old, familiar ones. At the end of the day my blissfully tangled mind cannot unravel enough sense to put a complete sentence together! All this newness, all of this expansion is entirely because of this little blog, My New Roots, and that means it is all because of you. I started My New Roots five years ago. Five years. Even if someone told me last spring that I would now be staring at a calendar full of sold-out cooking classes in exciting cities, interviews, lectures, and amazing collaborations with so many talented people…whew. My heart. Bursting. To celebrate my gifts and blessings, I decided to get ultra-traditional, with my own little twist of course. You see, I’ve never made pumpkin pie before. Ever. I was the kid that turned her nose up at every Thanksgiving dessert hour because who in their right mind would eat vegetables in a pie? Sickatating. But can millions of people be out of their minds together? Let’s not answer that. And after growing up a little, and sneaking beets, avocados and squash into more sweets than I could count, I thought it was high time I tackle the oh-so “bizarre”, pumpkin pie. Turns out, I rather like this little number. 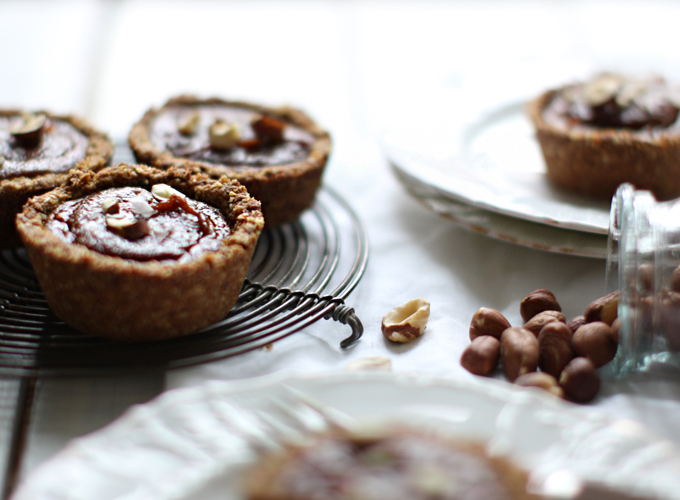 The tart shell, made of oats and roasted hazelnuts, is rich and buttery and has almost shortbread-like crumbliness. I used barley malt as a sweetener, but brown rice syrup would work well too, making the entire dessert gluten-free. The filling is creamy and spicy and pumpkin-y without it feeling like you’re diggin’ into a casserole, which was my greatest fear. The sweetener here was coconut palm sugar; a fairly new-to-me white sugar replacement. So far I am pretty sold on the stuff because it’s the “no-brainer” of white sugar substitutes, as you use it 1:1 in any baked recipe. This is often difficult with alternatives because so many of them are liquid; honey, maple syrup etc. Coconut palm sugar is a dry sweetener and crystallized so there is no guesswork around changing up all the other ingredients, which often leads me to total baking flops. Coconut palm sugar has a round, caramel flavour and a sweetness that is mellow. Said to be low on the glycemic index, it is a great sub for anyone looking to keep blood sugars a little more stable. You can read a rather thorough article about coconut palm sugar here. The icing on the cake is the salt on the pie. Bahaha. No, but seriously. The salt here is key – they are like little crystals of flavour-enhancing magic garnishing this dessert, so try to get one that is flaky (such as Maldon) and pretty to look at. If this is not possible, just use a good sea or rock salt with a clean taste that you feel compliments sweets. I trust you. Just promise not to sprinkle table salt all over the top. That is all. The pumpkin I chose for the filling was a Hokkaido pumpkin, which is grown locally here in Denmark. If you cannot find this variety, any sweet, flavourful pie pumpkin will do. Ask your grocer if you are not sure. 1. Preheat oven to 400°F/200°C. Slice pumpkin in half, remove seeds and rub with a little coconut oil and roast in the oven for 30-45 minutes until soft. Remove from oven and let cool. Scoop out flesh and set aside. 2. In a food processor or blender, puree all ingredients until smooth. Season to taste. 1. Roast hazelnuts in the oven with the pumpkin. Remove when toasted and fragrant, about 15-20 minutes. Remove from oven, set aside to let cool. Remove skin by rubbing nuts together. Reserve 6 or 7 hazelnuts for garnish. 2. 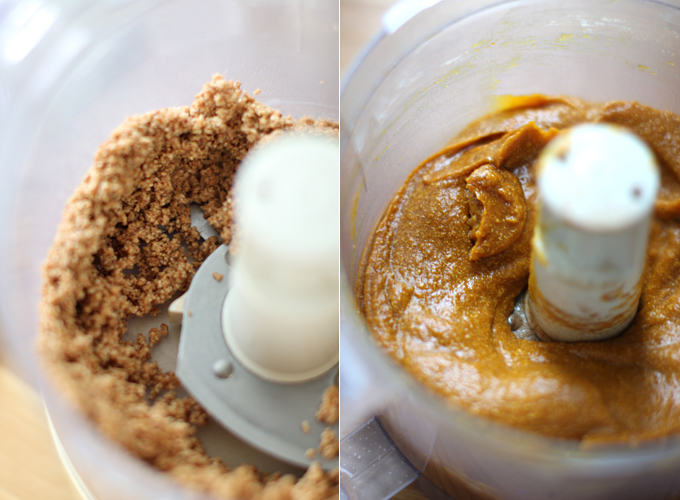 In a food processor, pulse hazelnuts until they resemble sand (do not over-blend, or you will get hazelnut butter!). Remove from food processor and set aside. 3. Place oats in food processor and blend on high until you have a rough flour. Add all other ingredients and pulse to mix. Dough should resemble a sticky, rough sand and hold together when pressed (see photo). 1. In a greased muffin pan, press a golf ball-sized amount of dough very firmly into each form. Fill each crust with pumpkin pie filling to the rim. Bake for 30-40 minutes until the filling is dark brown and set. 2. Let cool completely before attempting to remove from muffin forms. To remove, run a sharp knife around the outside of each crust and pop out mold. Garnish with flaky sea salt and a sprinkling of chopped roasted hazelnuts. This Thanksgiving I am just grateful. So, so grateful for everything that has happened in the last five years, and thankful to each and every one of you who continue to make that possible. Your unwavering enthusiasm for My New Roots, love for all things tasty and healthy, and your sharing of personal stories toward health and balance, have changed my life. As overwhelming as it all may seem I keep reminding myself that the universe does not deliver more than I can handle. Deep breaths. Challenges are opportunities for growth, whether that challenge presents itself in an empty kitchen or a room of hundreds of people. And I wouldn’t be here if it wasn’t meant to be. For that, and all of these lessons, I thank you again. Pingback: 62 Plant-Based Thanksgiving Recipes. Because 61 Just Won't Cut It. Pingback: Orecchiette mit Butternusskürbis und Pancetta | Packt's An! Is the oven temp fir the tarts also 400f? I am baking them at 350…. How did it turn out at 350? I am hoping to make this recipe and would like to use walnuts or pecans. ( I am allergic to hazel nuts) do you think that I shoukd modify the recipe? I want to make these delish little delights for my winter solstice party next week. I’m in Australia, and we NEVER use pumpkin in sweets or cakes, we eat it a lot as a vegetable. So I’m not sure what variety of pumpkin to use… Jap, butternut, Queensland blue are the main varieties here, any idea which would be the best one? Just made these to celebrate our Canadian Thanksgiving and they were FANTASTIC. Thoroughly enjoyed by all: vegans, carnivores, and 80 year old Austrians alike! Perfect consistency, and delicious taste… Can’t go wrong! I, personally, am so grateful for you, Sarah! Happy Thanksgiving (to you, your sprout, and family too)! Your words resonate with me on so many levels and your recipes are unwavering in their magnitude of flavor! I just recently came across your blog through GKS (how awesome are they?!) and I have to say, I’ve been hooked since first sight…bite…sip 🙂 Every one of your recipes turns into a literal TASTEBOMB…every time! Looking forward to see how your Kauai trip inspires you and spreads a little warmth back here in Copenhagen. I was just wondering where can I found some brown rice syrup?? Interesting take on the traditional pumpkin pie (my absolute favorite holiday dessert). Will have to try this one sometime! Hi Sarah, huge success, these were sensational! I also made a medium sized pie which held up perfectly. Thankyou! Buy New Kindle Fire HD – Watch Video Review. Hi Sarah, making these delicious pies right now. I can’t see what temp to bake them at though, maybe I missed it? I’m going to try 180. So far, from tasting the base and the filling before cooking them, oh my goodness pure HEAVEN! And now the house is filling with amazing odours,mmmm. Hi, Sarah. What is the purpose of the arrowroot here? Can it be substituted for anything? It is not available to me. Dhow cruise Dubai nice blog. lovely information sharing. Wow, i’m quite interested with this recipe of yours, it looks delicious and it’s really perfect for this holiday season. Thank you for sharing. Nice and informative Blog regarding help with chemistry this is really helpful for people who interested in Online Education. Thanks and Keep Continue to share useful information with us. Around this time of year pumpkin is a must. If for no one else, we will still have pumpkin pie for me:) This looks amazingly delicious!! Happy 5 years! Tonight, I helped myself to your raw milkshake miracle. Thanks for all the deliciousness. Sarah, I’m going to make these this holiday season. They look great. What I want to say though is thank you to you – I’m always promoting your blog to people I know back here in Canada, because you’re a shining example of someone who is doing good, doing great work, and with such class (love that your blog isn’t littered with advertising). The people whom I have convinced to check out your blog have loved your recipes and the aesthetic of your blog. You deserve every success. have you ever used stevia sweetener? I’ve seen many people recommend it as the best sugar substitute. It’s also available in many Danish supermarkets, the one from Hermestas (ingr: maltodextrin, Fructofibers (inulin 34%, oligofructose 8%), sweetener Steviol glycosid & Thaumatin). I’m curious but not sure if it’s really safe. Do yo have any idea? These were absolutely delicious! Topped with chopped salted dark chocolate and cashew vanilla ice cream! The crust was amazing! Sarah – any ideas how to turn it into cookies? maybe with some pumpkin puree? Thanks for another delicious recipe as ever! Do you think I could use honey instead of the brown rice syrup? These look incredible… Putting them on the xmas dinner menu – Sarah your success is well deserved. You just pull out fabulous work time and time again.. I love these, they look delicious! Oh honey! <3 <3 <3 Thank you for existing! Just as I am going favorite blog to favorite blog piecing different recipes together to come up with a healthy pumpkin pie you post this! I was going to try some version of the cranberry pear tart crust only with toasted pecans, some other pie filling. But this makes it easy, and looks delicious. Thankful for food and this blog! Hi sarah- I too never ate pumpkin pie as a child or an adult. I do like pumpkin bars and pumpkin cheesecake. 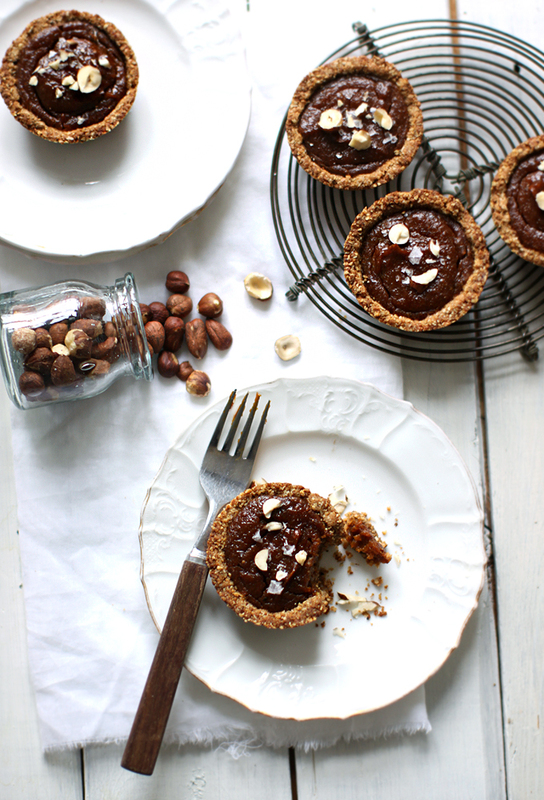 I think I may have to try your pie recipe though…..the hazelnuts have enticed me. Thank you so much for your recipes- I have made many of them and always look forward to your posts, each recipe is always delicious and thoughtful. 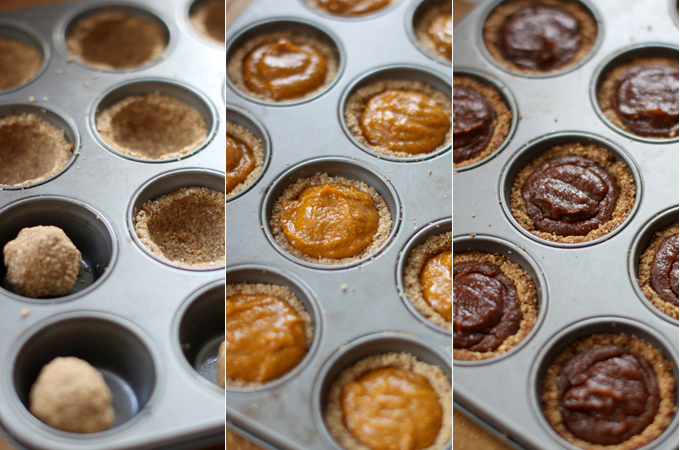 Your Mini Pumpkin Pies look delicious. Have a great day and thank you so much for sharing it here on mynewroots.blogspot.com. Hi- is pumpkin puree just fresh pumpkin pureed? or is it cooked first? Hi Leia – I think this could definitely be used as a big pie. My only concern is that the crust would break, but after a few days I see that it is holding up, so go for it! This looks amazing, Sarah! MNR is a huge inspiration to me. Your recipes never leave you feeling like you’re missing out on anything. Healthy and indulgent! Thanks you for sharing your gift! I made a Raw Pumpkin Pie! Thanks. Both the pies and your thoughts on gratitude inspire. See you later! Looks amazing! Do you think this could also be made as a large pie instead of minis? Hi Sarah, I have some good news for you: a fruit is defined as the flesh surrounding the seed(s) of a plant and so pumpkins, along with tomatoes and cucumbers, are fruit and so pumpkin pie is a perfectly logical fruit to put in a pie. This is so so so amazing… Will have to try this one for sure! 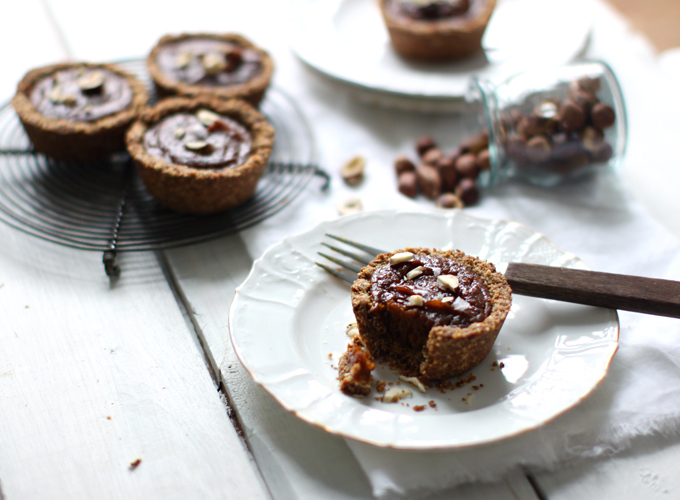 I think this would be great with chocolate filled inside as well… almost like a Nutella tart? Thanks again for the fabulous recipe, Sarah! Looks a bit like nutella filling which definitely is not bad! Not bad at all! Also nutella is better with a sprinkle of salt 🙂 Great recipe, thank you Sarah and safe travels to you! What a lovely post and such lovely thoughts. I don’t celebrate Thanksgiving but I feel like I should.Thank you for sharing! These look absolutely delicious. I’m going to try making a gluten free version! This is something that I can get behind. Thank you so much! Beautiful photos! Thankful to you, so lovely post. You definitely deserve a big thanks yourself!!! In putting yourself out there and sharing your gift you’ve changed countless lives, including mine. I’m healthier and happier in large part because of your fantastic recipes. Starting to read your blog a few years ago was a paradigm shift for me and my ability to make good, healthy meals for me and my family. Meals that I feel good about and my husband doesn’t turn his nose up at. Truly an amazing feat! So a big thank you to you for all that you do! Thank you, Sarah! Reading and cooking your recipes is my favorite part of every week! this is definetly a NON-“Sickatating” Mini Pie. It must be just delicious. THANKS for GIVING us so many healthy tips and recipes.